At this time of year loads of sea anglers flock to piers, jetties and rocks to fish for Mackerel, Pollack, Wrasse and Coalfish. In fact, it's such a fun and enjoyable experience that many Game, Coarse and Predator anglers also participate. Why? Simple tackle, loads of great marks, the opportunity for multiple hook-ups, fresh sea fish - to eat, a great way to spend a few hours and if the weather is kind, even better! So if you've never tried it, get out and do it and if you're confused by the mass of sea spinning rods out there, don't worry. 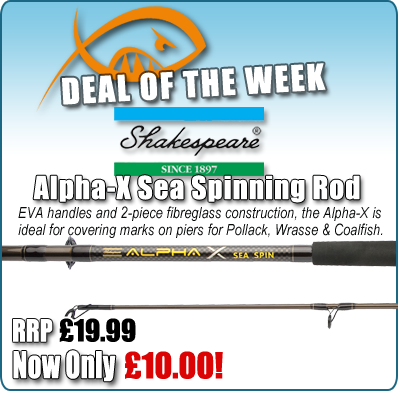 You can get the Alpha - X Sea Spinning Rod, with an RRP of £19.99 FOR ONLY £10!! The Alpha-X Spinning Rod features lined guides, EVA handle and robust, 2-piece fibre-glass construction, striking graphics, and did we mention it was only a tenner? Limited stock available so grab yours today and don't miss out on this excellent sea spinning rod offer.